OCCK Transportation is recognizing some of its drivers as recipients of the 2017 Driver Safety Recognition Awards. The OCCK Transportation Division Safe Driver Recognition and Award Program is designed to distinguish and honor OCCK Transportation drivers who have proven their skill in avoiding accidents and consistently perform their jobs in a safe and efficient manner. Recipients exemplify professional driver standards and a commitment to safety. One Year Awards went to John Greenwood, Tawnie Heard, Trudy Morton, Michael Nicholson and Stanley Oaks. Two Year Awards went to William Arehart, Paula Downie, Terrell Green, Shelley Hanchett, Ricky Levin, Stephanie Mayer and Kenny Waldman. Jaimie Wintholz received a Three Year Award. Those receiving Four Year Awards were Debbie Dragoo, Richard Holmgren and Susan McMahan. Jason Tieking received his Five Year Award. Rena Bishop, Joseph Dickinson, Timothy Dickinson, Chris Ducharme and Daniele Whitaker received Six Year Awards. Two drivers received Seven Year Awards: Larry Holmgren and Paula Stark. This program was created as authorized by the National Safety Council (NSC) Safe Driver Program. 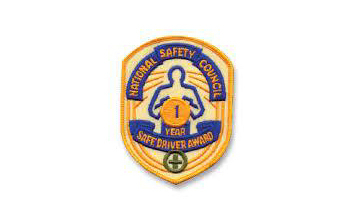 The NSC Safe Driver Awards are the recognized trademark of professional drivers who have proven their skills in avoiding accidents. They are the highest honor for professional safe driving performance. This program recognizes the number of years each eligible driver has worked without incident.